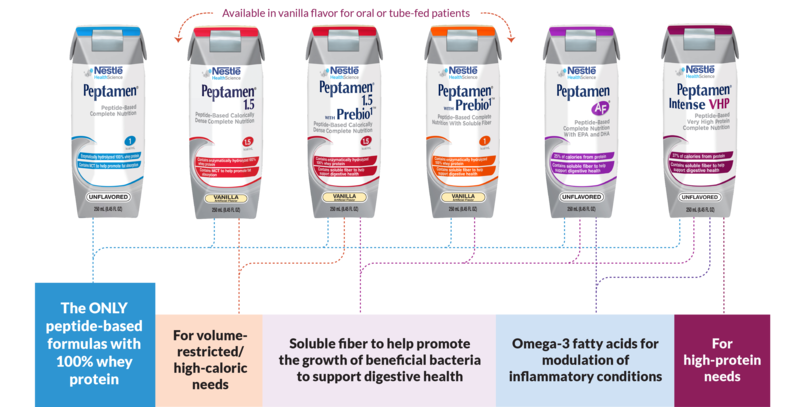 Based on your individual needs, your doctor has chosen one of the solutions in the Peptamen® family of formulas. While every Peptamen® tube-feeding formula contains smaller, easy-to-absorb peptides and a high percentage of fat as MCT, there are variations in enteral feeding formulations based on specific needs. Your doctor has prescribed the enteral feeding formula brand that is shown to work best for your present needs. Your doctor has prescribed daily tube-feeding goals so that you get the proper amount of nutrients each day. It is important to not skip a feeding. You can download this Goals Chart to help track and record your daily intake. Should you have any questions or concerns, be sure to contact your healthcare professional.